From the creator of the Platinum Best Seller Companion System, this abstract system for handling chases makes running a chase scene fun, easy, and exciting! 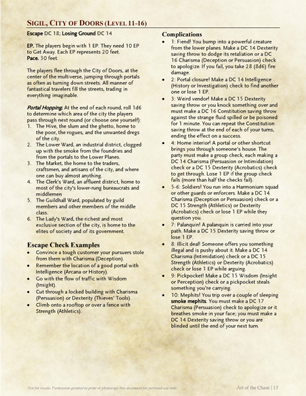 The Dungeon Master’s Guide presents a simple system for running chases, but that system largely relies on movement speed alone, and doesn’t present a lot of opportunities to create a fun and interesting scenario, nor for players to use a variety of skills or abilities to help them get away. Dramatic Chases presents an alternative, fast-pace chase system that allows all of the players to shine. This system abstracts the chase into Escape Points, which the players earn by making skill checks or using their abilities creatively. When they've earned enough, they escape! All of the player characters are assumed to be together during a dramatic chase. They escape together or they get caught together. 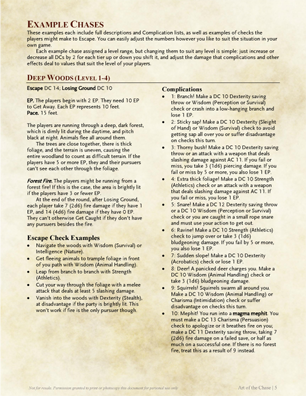 When the rogue vanishes into the shadows, it makes the whole party, on average, harder to track. When the fighter climbs an obstacle, it keeps the whole party moving. It’s not important to track exactly where each party member is in relation to one another, who has a higher movement speed, etc. Everyone is simply contributing to the party’s overall progress. Includes 10 detailed example chases, but building your own is easy with the advice provided! “From the maker of The Companion System”. SOLD! That’s one of the best products I’ve ever bought here. Picking this up once I’m on my computer instead of my phone, looking forward to it!